What's Going on with The Oscars? I’m sure you’ve noticed but the it seems like the Academy Awards has a case of Schizophrenia. First, they announce a popular movies category. Everyone freaks out about that so they nix the category. 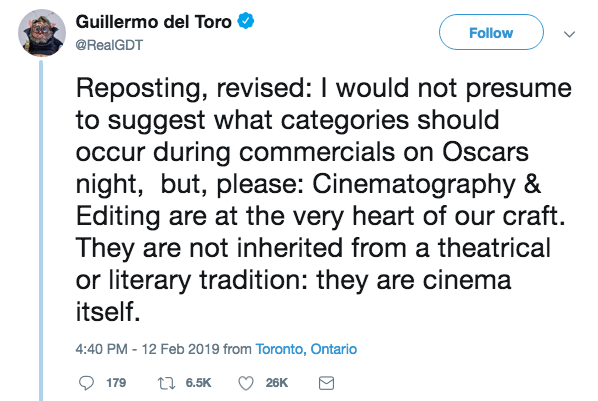 Then they announce that the awards for Cinematography and Editing will be given a second class status by reducing their screen time during the awards ceremony, just to back down once revered directors such as Del Toro, Scorsese, and Spielberg scolded them publicly for the move. And then Kevin Hart. Need I say more. What is going on with the Oscars? As I speculate, I think back on the last several years, and is seems to me that the Academy is caught between a Rock and a Hard Place. The Rock is their prestige as a bulwark and bastion of Cinema as a high art through their Awards. The Hard Place is an extravagant ceremony that gushes over every celebrity, their glamour and beauty, and the ratings (read advertising dollars) that this cavalcade of beautiful people rakes in for the Academy. For 90 years the Academy has done more than simply give out an award. Through their efforts, cinema has been elevated to a place in our culture as the premier art form. Through the award, the film industry examines itself every year for which movies are admirable for their acting, their political messages, their cinematic language, and popular influence. This is no small task as these all overlap, but the conversation surrounding the awards usually reveals why a movie won an award. It may be that the film speaks poignantly to a national moment or hurt. It may be that a performance revealed something to us all which we had forgotten. It may be that a cinematic vision caused us all to see a technological marvel or a new side of nature or the expanse of space. Some years the Academy even notices that they have neglected to reward people who ought to have been rewarded and they give Special Awards, Lifetime Achievement Awards, or Awards for performances that didn’t deserve it but the actor did for something they were in a couple years ago but slipped by the Academy. All in all, there are few awards that mean as much as an Academy Award. Since 1929, the Awards Ceremony was a smash hit. In the early days of the award it was a private, invite only dinner party with 270 guests. Newspapers were informed early of the winners s that the evening edition of the newspaper could almost simultaneously reveal who won to the whole country. Through the years the show became more of a show and less of a ceremony, and was covered live, first on radio, then on television. However people heard about, and watched it, the Awards Ceremony was an exciting look into celebrity lives and work as well as an inside look at how the industry thought of itself. It was a chance for people to see more stars than they could normally see, all dolled up, all in the same place, and find out which movies were the most worth watching. When I grew up in the 90s and early 2000s, I always thought of the Oscars having several purposes, each for a slightly different kind of viewer. For some, it was the parade of stars that represents everything that Hollywood represents. For others, It was about finding out who won and thus, which movies would get that Oscars Bump and thus, which were to be the widely popular films in the coming months. For still others, The ceremony was a way to find out about the films that were harder to find but had the appreciation of the ‘artistic community` as opposed to the popular masses. I had intended to write an article about how the Academy had lost its way and compromised more on the side of populism than that of art, but as I researched, I found myself shifting in my view. To many it seems like the Academy is being really wishy washy when it comes to following the winds of public outcry, flip flopping on awards ideas, ceremony considerations, and hosting styles over the last few years. Yet, as I look at a Timeline on the Oscars.org site I notice a few things that I had never considered before. The Academy as an idea, is something that I have had rooted in my brain based on some very specific awards ceremonies that stand out in my memory but the history of the Awards is much more complex and the reality of how the awards have grown and operated is very different than the monolithic awards I had constructed in my fantastic memory. Over the 90 years of their existence the Academy has consistently added and removed awards from the ceremony itinerary, added awards to the roster, created a separate technical awards night, and adapted show styles and award recipients based on the changing times. The thing that has changed for them in recent years, and perhaps the real source of troubles, has been the internet. Like many industries, the film industry has been increasingly and constantly challenged by the ready availability of information in the past 20 years. I’ll be the first to admit that they aren’t always adept at handling that culture shift well, but as anyone these days should understand, it is not an easy shift to make and the world seems incredibly impatient to grant grace to anyone struggling. Here are some of the challenges that I see the Academy struggling to handle effectively. How to engage audiences with a show that is fundamentally the reading of a list, in a culture where we read lists for breakfast. How to give an Award in an era which craves audience participation, when the award is given before many people have had a chance to see the films. How to maintain the Award as the Gold Standard for awards in a culture that is increasingly fragmented and whose primary means of entertainment has shifted from singular works of art to serialized content. How to navigate the waters of a culture whose brand loyalty and clique tribalism has become so overgrown that not giving an award to one group’s darling feels like a personal slight against the whole clique’. How to be an industry award given by and industry to its own members without feeling self-congratulatory in an era where more and more people have dubious feelings toward industries which spend millions of dollars and don’t seem to benefit anyone but themselves. I am sure the challenges are more diverse than that but just a sampling shows you how complicated of an issue changing the Academy Awards would be if you had to do it. Recognizing that the Awards have always grown and changed over the years gives me hope that when the Academy blunders, they will correct. When they take away a category that they thought no one cares about and were wrong, they will listen. When they hire a host that they realize will be a problem, they will get rid of them. I don’t think that the Academy Awards are going away any time soon, and I think, for the first time, that I will end up being an every year watcher, not because of what the Awards are or have been, but because I am interested to see what it is that they become. I do think the Awards are struggling, though, just the same as we all do, to find our footing in a world that is changing fast. They are not immune to struggles nor unkind, quickly written tweets and letters of scorn. There may be rough years and stellar years but it’s all just a process we are all going through together. Instead of sitting back as critics and pointing our fingers at the Oscars blogging, “how dare they,” and, “what a clueless group of attention seeking millionaires,” perhaps we should join with them as a community and give constructive help to them as they seek to whether the storms of shifting culture. The more we recognize this, the more we will enjoy the Awards and give Grace and Patience for the Academy.